Instant Imprints Meriden, CT | Custom T-Shirts, Embroidery, Signs and More! At Instant Imprints Meriden, our customers come to us when they want to be more visible to their customers. We create that visibility five different ways: Branded Apparel (embroidery), Signs & Banners, Promotional Products, Custom T-Shirts and Print Services. Deepan: Thanks for delivering the items. The shirts are great and so are the signs. This company does great work. Good prices, Good quality and great people to work with. Instant Imprints is proud to serve Meriden with superior custom t-shirts, printing services, promotional products, custom banners and branded embroidery items. When your business needs the highest quality promotional goods available, you can turn to Instant Imprints to get your project done right. 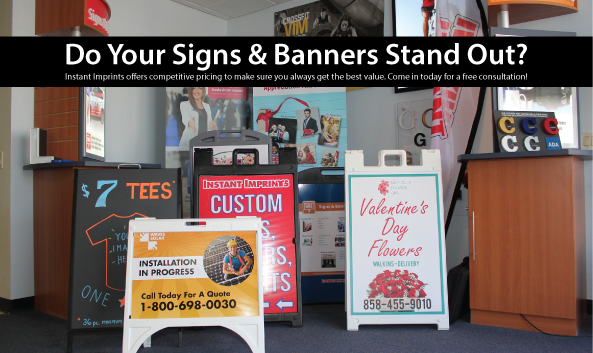 Whether you’re looking to reach the masses with a catalog campaign, or you’re looking for a storefront banner, our Meriden Image Experts are happy to make your promotional goals a reality. At Instant Imprints in Meriden, we take pride in delivering excellence with each other. We make it a point to get your job done right the first time, and delivered when you need it. When you need the quality of a global industry leader, combined with the local touch of a Meriden-based Image Expert, Instant Imprints can cover all of your promotional material needs. Using a wide variety of branded items such as custom t-shirts, banners and branded goodies like water bottles helps your brand to earn those valuable repeat exposure that drives business your way. Many shops claim to provide quality custom t-shirts, but no one can match the level of expertise and the technological capabilities of Instant Imprints in Meriden. Our custom t-shirt service gives your brand the power to travel the globe, on the backs of your loyal customers and employees. Your logo can become a fashion statement, with the brilliant colors and sharp edges that our state-of-the-art production processes provide. If you need help with choosing materials, fonts or other design options, our Meriden Image Experts are more than happy to help you make the most of your project. Custom signs and banners give your brand a serious presence wherever they are found. Our service can help you with whatever your sign and banner needs are, whether you’re looking to decorate the streets, your storefront or the skyline. Durable, portable and usable indoors and out, custom banners can be taken to wherever they can serve your brand best. Just ask your smart speaker, “Where’s the best custom banner service near me?” You’ll be sure to find Instant Imprints in Meriden! No matter what your needs are to build a better brand, Instant Imprints can provide you with the tools. Your brand visibility can take to new heights once you stop in at our showroom at see what the possibilities are. Visit our Meriden Instant Imprints Center today, give us a call at (203) 235-6000, or request a quote online to get started today!